I was just clicking through a friend’s Facebook photos of his three daughters and it got me thinking about my own daddy, who also has three daughters, and couldn’t be happier. It reminded me of a funny story about something my dad used to loooooove to do when we were kids. Mind if I tell you a story about when I was a kid? See, my sister and I (at the time there were only two of us, our third sister was adopted later), had an elaborate Victorian dollhouse that my parents had built for us one Christmas. More than we played with any other toy, we spent hours playing with that dollhouse. 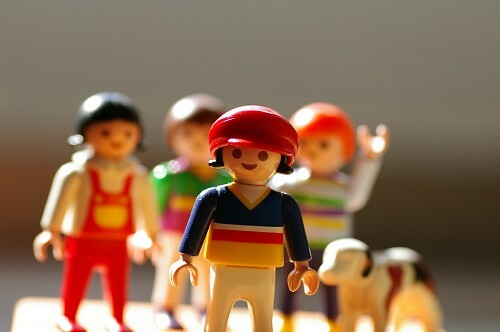 All the people and furniture were Playmobil. So they were sorta like overgrown Legos. Like this: We didn’t just have the traditional dollhouse figures, either. There was an entire “school” set up in the “attic,” a hospital complete with surgery unit on the lower porch, a police station on the upper porch, an ambulance, and EVEN A HOT DOG STAND: My dad, of course, loved more than anything to make us giggle and squeal. Usually this was related to telling us that the Belle, a riverboat in the town where we lived, had sunk, which was a guaranteed way to elicit squeals; or good old fashioned “tickle torture.” But when it came to the dollhouse, he had a secret weapon. Macho Man Randy Savage: Macho Man would regularly show up to “visit” the dollhouse and basically wreck the place, while my sister and I howled “NOOOOOOOOOOOOO MACHO MAN! NOOOOOOOOOO!” In our little minds, we could SEE this wreslter man, stomping his feet, kicking over furniture, punching the dollhouse people. My dad would just laugh an evil laugh as we tried to pull Macho Man out of his hands and push Dad away from the dollhouse. I have a feeling it was the only way this “boy” knew to play dollhouse with us. And really, we secretly loved it. We’d exact our revenge by finding Macho Man around the house and hiding him, so dad couldn’t find him and make him “come visit.” Of course, this all ended the day we “hid” Macho Man in the trash and forgot about him until after trash day. Whoops!